Digi-Schlock: CARRIE (2002)/THE RAGE: CARRIE 2 (Scream Factory 2 Blu-Ray Set) – Schlockmania! Between its two cinematic adaptations in 1976 and 2013, Stephen King’s debut novel Carrie also inspired an unexpected sequel in 1999 and a television adaptation in 2002. King completists might want to know the latter two films have been collected by Scream Factory in one convenient double blu-ray set. It gives these two productions a high-def bump while also collecting the extras from their past DVD incarnations and even throws in a new, noteworthy extra all its own. Transfers do well by the source material. 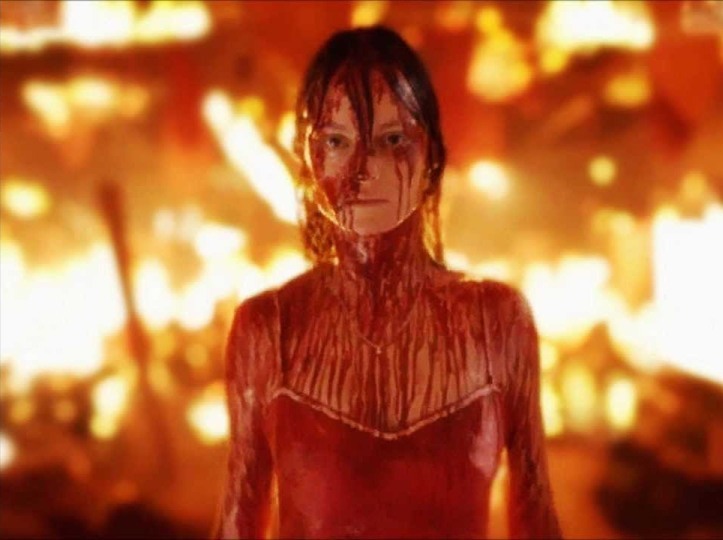 The 2002 version of Carrie was shot digitally at an early time in the digital cinema movement and also favors a softer, gauzy look so the level of detail varies but colors look solid. It’s probably as sharp as it can look given its technical circumstances. The Rage: Carrie 2 looks fantastic, offering a richly hued and lovingly detail image that makes its excellent cinematography look beautiful. Both 5.1 and 2.0 lossless stereo mixes are provided for each film. The 5.1 mixes were listened to for this review and they offer a nice blend of dialogue, effects and music: the mix for The Rage: Carrie 2 is a little more complex and benefits from the presentation here. Extras are provided for each title. The Carrie disc features a commentary track by director David Carson and cinematographer Victor Goss. Carson talks about how his version of the story differs from Brian DePalma’s film, with a lot of attention to the elements that expand the storyline for his version and the choices he made in modernizing it. Goss reveals a unique connection to the cinematographer of the original Carrie and also discusses techniques used in different camera setups. Both men discuss how they used a mobile camera to give the actors freedom and there is some fascinating chat about how the prom sequence was achieved. The track is low-key with the occasional gap of silence but it offers plenty of informative material for fans. The other extra on this disc is a trailer that does a good job of selling the film’s detective story approach. The Rage: Carrie 2 boasts two commentary tracks. The first is a solo track with director Katt Shea, who talks about the film from the vantage of having to take over from another director. She reveals how she got the gig, how she got the actors to tweak their performances and offers her psychological/social analysis of the characters and story. She also explains her directorial choices and talks about the methods used to achieve different visual tricks. It’s a relaxed but consistently engaging chat. The other commentary track is new one that brings back Shea and pairs her with cinematographer Donald Morgan and filmmaker/moderator David DeCoteau. It’s a really fun supplement to Shea’s solo track, with Morgan and Shea working well together. They both offer their side of the story behind Morgan’s hiring, talk about the technical side of how different shots were achieved and discuss the challenges of reshooting two weeks’ worth of material without extra money or time. DeCoteau does an excellent job of moderating, keeping the other two prompted with an enthusiastic, filmmaking-savvy line of questioning. He also offers a great appreciation of Shea’s work as a director. As an added bonus, Shea tells some fun stories about her fan favorite Stripped To Kill. In short, this a must-listen for any fan of the film or the director. The Ra ge: Carrie 2 is rounded out by some deleted scenes and a trailer. The deleted scenes come from a video workprint source and Shea talks over the top of them, explaining her thoughts on each and why it was deleted. These moments include an alternate version of the ending with a different, very odd digital effect. The trailer is a fast-moving piece that pitches the film to the teen horror crowd and makes good use of its wild climax. In short, Scream Factory has done well by Carrie completists, offering spiffed-up versions of overlooked films from its history of adaptations and offering plenty of extras. If you collect King adaptations, this set is worth adding to your collection. To read Schlockmania’s review of Carrie (2002), click here. 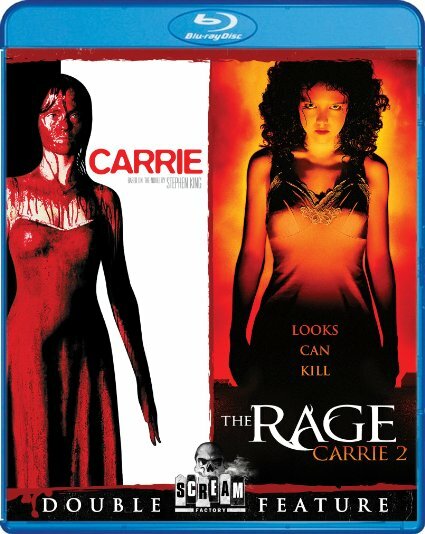 To read Schlockmania’s review of The Rage: Carrie 2, click here.